Sixty-five years ago her sisters gave my spinster great-aunt a rather special present for her sixtieth birthday. It was a modern, with-it, present; soft-topped and green, the latest thing in fashionable design. 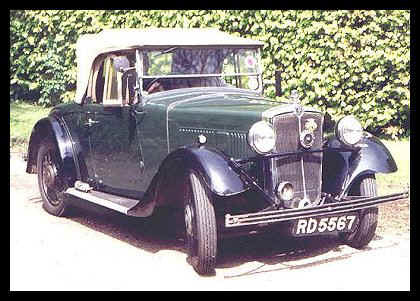 It was a Morris Ten-Four, with a dicky seat and a retractable canvas hood. The guarantee card reminds me that it was registered on 26th May 1934. It gave my great-aunt much joy; it gives me much joy still. Not many Morris Tens, I believe, were built in this style. Most of them came in saloon form. In 1957 - I think it was - I remember parking in Cadogan Square next to a motor car almost identical, in build and colour, to mine but I cannot recall having come across another one since. No doubt readers will tell me that it is high time that I came to Morris Register rallies and saw for myself that such models still exist but I am content, in my eccentricity, to dream that my motor car, if not unique, is unusual enough not to have rivals. It has not had an exciting life. It does not even have a name. In my family it is known simply as The Old Green Car or occasionally, remembering its first owner, Aunt Janet's motor car. But for all sixty-five years of its existence it has graced the roads of the same little village, just west of Henley-on-Thames, and when my daughter drives it from time to time she is the fourth generation of our family to do so. Sadly, and surprisingly, there are no pictures of the Old Green Car extant from the first twenty years of its existence and I don't quite know why. The first photograph which I have - and I cannot even find that now - shows me sitting in it as a teenager and the flags and bunting on the walls of the house behind indicate that the picture was taken during the summer of Coronation Year - 1953. It was in the following year, a few months before Aunt Janet died, that she gave the vehicle to my father and that I myself, having recently passed my driving test, drove it for the first time. I took it to Aunt Janet's funeral, just as forty-two years later I drove it to the funeral of her niece, my mother. We started at once to keep a petrol log book (it is still in use) and the first entry, on 20th December 1954, shows the mileage reading as 37,240. The reading on 25th May 1999, the day before the motor car's sixty-fifth birthday, was 88,592. Aunt Janet therefore must have used it quite a lot in the late Thirties because it spent most of the war years, when petrol was rationed and hard to come by and when road licences for the most part were restricted for periods when fathers came home on leave, in its garage. At any rate it does not seem to have been licensed at all during 1943 and 1944. After the war Aunt Janet did little more than potter round the local area in it, mainly going to Henley and back to do some shopping, although my poor old uncle, a gallant and decorated soldier who took to gin and died of it, commandeered the vehicle for one or two months when he was invalided out of the Service in 1952. My father handed ownership of the Old Green Car over to me in 1960 when I was an undergraduate at Cambridge (my University permit of 1961, which I have still, seems to be in the same format as permits issued by the University today) although I had been its main driver during the preceding years. Indeed during my National Service it was my only motor car - in York, in Chester and in Colchester - and I used it and, I am ashamed to state, treated it as any young subaltern uses or abuses his motor car; I have dim memories of driving it after a party at a relatively considerable speed for the time with four other young officers on board. Those were the days when a police constable would say "I think, Sir, that you have had a little too much to drink; you had better go home!". It was a different world. As the motor car and I grew older together it was treated with more respect. When, as a regular army officer, I was stationed in the Far East my mother and father maintained and cherished it and drove it with the care which it deserved. Maturity, marriage and children and the dawning realisation that I had inherited something precious brought out the conservationist in me. 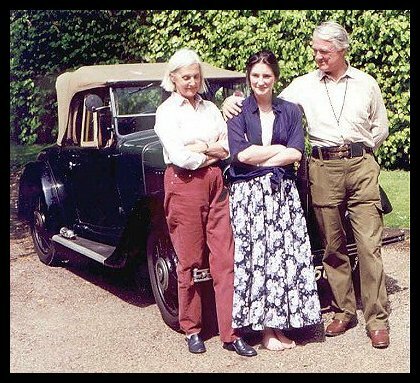 For the past thirty years, as other cars have come and gone, Aunt Janet's motor car has occupied the same place in our garage, always taxed, always insured, but used only at infrequent, but regular, intervals, year-in year-out, on dry days for short journeys. Indeed it is at its most glorious when wandering across country along little Oxfordshire lanes with the hood down. - and pretty girls are still taken in by it, as well as occasionally being taken out in it! Mechanically it is sound. Seven years ago the engine was in distress but kind Mr Adrian Tyndale, of the Morris Register, carried out some major surgery on it with great skill and one can say almost literally that now it is in its second childhood. The engine runs so sweetly again. The brakes are a bind though - also literally! A design fault, I am told, but they really are tiresome and brakes applied are liable to stay applied. Spectacularly recently, having halted at a red traffic light at a busy cross-roads in the Fulham Palace Road in London, the vehicle would not budge, like an obstinate donkey, with the brakes full on. We must have been a confounded nuisance to others for a bit, I am afraid. Most of the bodywork is original. The badge of Hewens Garages of Reading, a firm long-since defunct, from which the vehicle was bought, still adorns the engine compartment and the interior trim is almost as it left the factory. The original hood leaked over my late father during a rainstorm in 1955 and he had it replaced with another one with a slightly wider rear window. Both headlights now dip together in accordance with the requirements of the modern Road Traffic Acts, whereas the off-side light was designed to go out when the near-side light was dipped, and the rear number plate is illuminated now by two lights rather than by the original one only. The paintwork, after sixty-five years, is in need of renewal though. The mudguards were repainted in black in the Fifties - as a child I remember the white flashes splashed onto the wings during the war when driving on sidelights in the blackout demanded some additional form of warning - but that paint is flaking off now and rust is appearing. The green on the body is cracking too. It appears to be surprisingly difficult to find anyone prepared to repaint the motor car - at even a prohibitive price, let alone at an affordable one - and the need is becoming urgent. If any reader can give advice he or she will earn much merit as well as much gratitude. As a family we are fortunate in our heirloom. Sixty-five years old the Old Green Car may be but we trust that it is not due for retirement yet.